Java is the best language of the world and you're wasting time every second of life that you don't study Java. But where to start? Here in the blog we have the course. But what program I use? Have to pay anything? Where I write the codes? What do I install? You have to download something? JDK? NetBeans? Huh? Click to begin! Now that you've read articles about programming, programming languages ​​and the Java language and it is here, I assume you have chosen to start the Java course. Congratulations, you very clever. I see you want to guarantee your place in the business. But I can not say that at the end of the course you will be prepared to do Java softwares. In fact, during the course you will do the softs, because I hate just theory. Among the many articles we will always stop to make applications such as calculators, games, calculate the chance of winning the lotto, create a database etc.. The most important thing is to do something useful, is not it? Well, let's install Java to program it. Probably you already have a JRE, which is the Java Runtime Environment, used to run Java applications, such as the site of that bank or that game online. But using Java is a thing of the past, now you will program in Java. 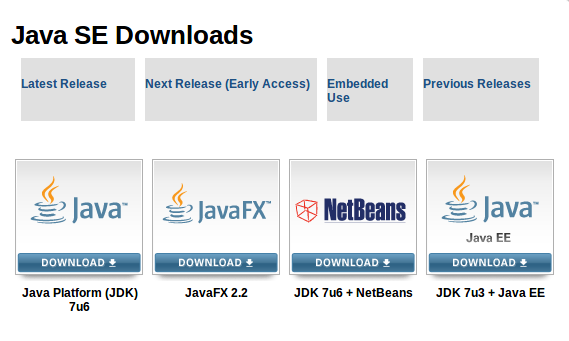 For that, you'll need the JDK, Java Development Kit, which is the Java Development Kit, which already contains the JRE! There are two ways to run Java applications, but will use only one, which is the most used and simplest. The other is a command line, or through that little screen black. To run well, you have to go through DOS or Terminal to the folder that you created the code files, compile and run using the commands 'javac' and 'java', but it is a slow and tiring. Let's use an IDE, NetBeans, which is a program of Oracle's own site, creator of Java. This program automatically compiles and runs the code you write, and do the error checking, completion codes, visually display the files in your program (if a large project, you have dozens of files) plus many other features. In addition the installation is fully automated. Much simpler, no? There are several types of Java, such as mobile, ME, etc. Card. We will use the Java SE, to create applications for computers. Note that you can download Java separately and install on your computer and then another IDE. In our course, recommend to install the package 'Java + NetBeans' because he will install Java and NetBeans IDE and configure for you. PS: When I write the article, the URL is that. At the time you read, versions, and URLs can be others. If other, download the latest version. Avoid headaches and always download the official sites! Accept the terms and conditions by clicking 'Accept License Agreement'. Then choose your OS (Windows, Linux or Mac) and download the file. Ready, you can develop and create applications in Java. For this, simply start NetBeans. PS: If you use Windows and do not want NetBeans, look up for a specific tutorial about that. There are millions on net about that. However, as you are starting, we encourage you to use NetBeans. In the future, when an expert, you can try another IDE.